But will it get a matching tiny keyboard? Everyone is expecting to see a new iPad Mini 5 in short order this year, but should we expect one with an Apple Pencil and Smart Keyboard to match? That's what software developer Steve Troughton-Smith claims to have discovered digging through iOS 12.2 beta files. Of course, coming from simple name-drops, and coded ones at that, Troughton-Smith warns to take his findings with some salt. The developer has found several references to what he deduces are two different iPad model codenames, each of which will likely come in two configurations available: the J210/J211 and the J217/J218. He also notes that it's unclear whether the tablets use Touch ID, Face ID or neither for biometric login. Tiny accessories for a tiny tablet? 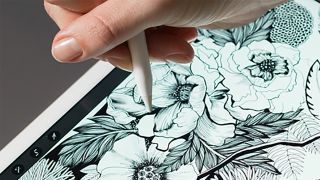 While it seems as if these two new iPads will be par for the course in terms of design and form factor, we wonder if the iPad Mini 5 will support the Apple Pencil and Smart Keyboard. Apple has certainly expanded support for its pro-grade peripherals last year with the launch of the general iPad, complete with education pricing. However, would those inputs even work with such a smaller tablet? Will Apple make special versions of these specifically for iPad Mini 5? We're holding out for an Apple product launch event in the March time frame, as the company has held events in March for several years now. Hopefully then we'll see a tiny stylus and keyboard for Apple's next tiny tablet.